I can think of few better ways to spend a Saturday evening in early summer than running in a spectacular part of a spectacular city as the sun begins to go down. 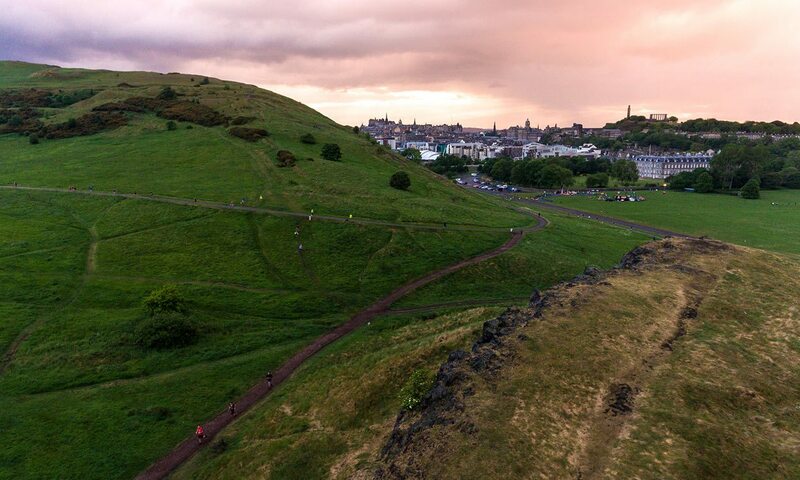 The city in question was Edinburgh and the reason for running (as if one is ever needed) was to take part in one of a new series of events taking place across the UK – the Salomon Sunset Series. The idea behind these off-road 10km runs is simple – to persuade people to ‘step off the pavement and into nature’. Few brands know trail running better than Salomon, who boast a stable of international athletes to be found at the very top of the sport. The Sunset Series, however, is pitched at people who are looking to either switch from road to trail for the first time or are looking to expand their knowledge on the best way to run when heading for the hills. I have definitely acquired more of a taste for getting my miles in away from the tarmac so, in the interests of furthering my running education, I decided to go along. There was much to see. 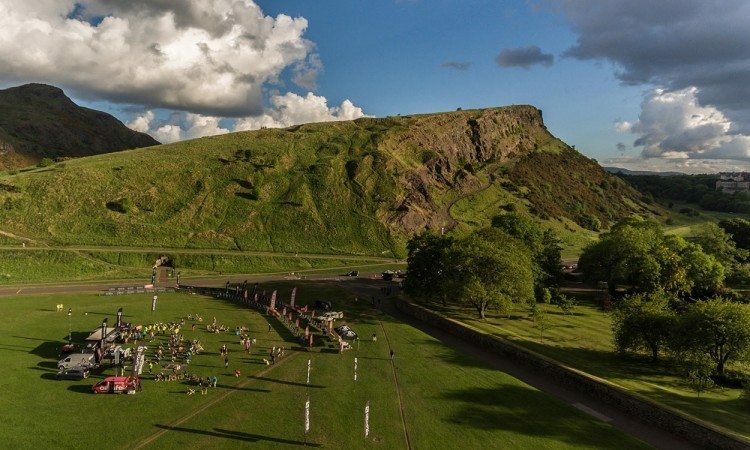 Not only is the venue of Arthur’s Seat and Holyrood Park always a sight to behold but each Sunset event is not just about the run – there are also a number of workshops available and guest speakers on hand to provide an extra insight into off-road running. First up was a Q&A with Salomon athletes Tom Owens and Ricky Lightfoot, two of the finest exponents of their craft and men who do remarkable things each year in the midst of spectacular landscapes. Yet their understated, welcoming manner made their superhuman feats seem like the most natural thing in the world to be doing. They are clearly in it for the love of the sport – not to mention the love of pizza! With a little inspiration in the tank and a growing curiosity, next up came a trail running workshop with Donnie Campbell, the British ultra trail running champion. A coach as well as an athlete, Donnie crammed a wealth of advice and technique pointers into his clinic in the shadow of Arthur’s Seat. The top tip for running uphill? Stay relaxed and rotate your shoulders to keep up momentum through the hips. As for coming down? Don’t be afraid, don’t slam on the brakes, always land on your forefoot and look at least five metres ahead at what’s coming. Oh, and a forward lean will speed you up whilst a backward tilt slows you down. Once all of that was digested then there was time for a spot of yoga, a look at some gear and some more words of wisdom from Donnie before it was time to head for the start line. There was a very relaxed air to proceedings as the runners were brought forward with a lone bagpiper playing. Scotland being Scotland, of course, the sunny evening had given way to a downpour just before we got started. The rain abated, however, and we set off on the course which would take in two 5km laps. There are countless trails to follow on and around Arthur’s Seat – it really is a fantastic trail running playground – but the route which had been mapped out was spectacular. After a gentle introduction we hit Radical Road and a steep, lengthy climb which immediately allowed us to put Donnie’s instructions into practice. The lung-busting terrain was offset by the fact that, to our right, an amazing view of Edinburgh was opening up. As Donnie put it “once you’re at the top of the hill, you’ve done the hard work. Then it’s time to have fun”. And he was right. Once we had crested the rise on Radical Road, then came some of the best running terrain I’ve had the pleasure to experience. With Donnie’s downhill advice in my mind, I was able to lengthen my stride, open up and hop, skip and jump my way back down to level ground. Then we got to do it all again! On the second trip up Radical Road, the heavens well and truly opened again but by then it felt like everyone was having too much fun to care. I know I was. It was a soggy but happy bunch of runners who crossed the finish line and, by then, there was just the hint of a sunset. Relying on the weather in Britain is a risky business, of course, but on this evidence trail running is absolutely a gamble worth taking.